← September 11: How will you remember and pay tribute? On September 11, I will remember the tenth anniversary of the terrorist attacks as I have every year since that awful day: I will be in church, meditating on a piece of steel from the fallen World Trade Center, and praying for the families of all those who were lost that day and in the ensuing war. Father Andrew drove from Chicago to New York that July and picked up the 2-foot, 200-pound section of I-beam from the twin towers. A former military chaplain, he drove it back to the church wrapped in an American flag, treating it with the same respect given to a fallen soldier. On the one-year anniversary of the attacks, the beam was brought in solemn ceremony to the church on a fire truck with local firefighters and police present, memorializing their fallen brothers in New York. 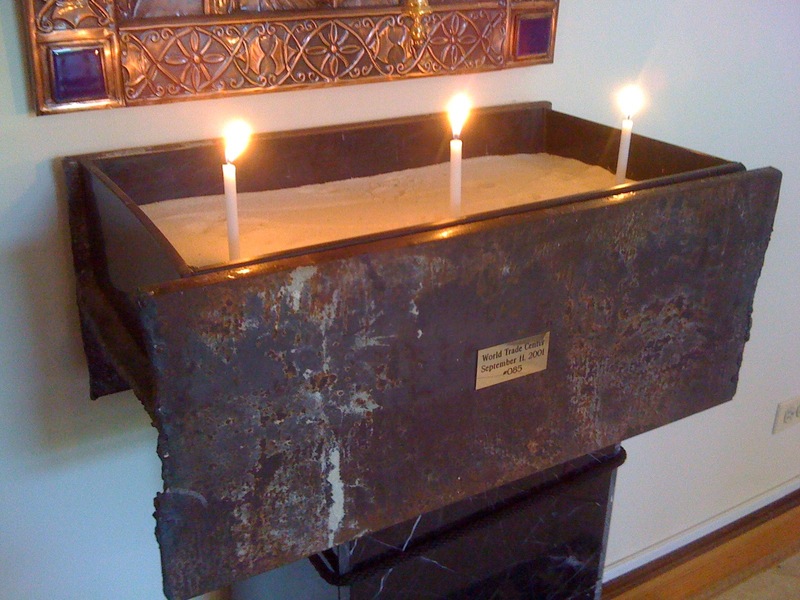 It was mounted on a pedestal, and a rectangular box was made to fit inside the beam and filled with sand, to hold lighted taper candles. The beam now sits in the entrance to the church, beneath an embossed copper icon of Saint Nicholas with images of the twin towers and the destroyed church incorporated in the icon. Anyone can visit the beam and light a candle. Every Sept. 11, we have held a memorial program and invited survivors of the attacks to discuss their experiences. The beam is brought into the middle of the church and people light candles and can view the beam and rubble from the Pentagon and the plane crash sight in Pennsylvania. Members of the Civil Air Patrol read the names of fallen soldiers from Illinois. It is a heart-wrenching experience to memorialize the attacks every year; to see photos and video from that day again. But I think it is important to never forget. As I look around the church and see so many people in uniforms of various kinds – from firemen to military service membes to Boy Scouts – I am freshly reminded of how much has been sacrificed, and is still being sacrificed, every day for our freedom. Every September 11 for the rest of my life, wherever I am, I will be lighting a candle and thanking God for American heroes.